It's the most wonderful time of the year...the Sephora Sale! 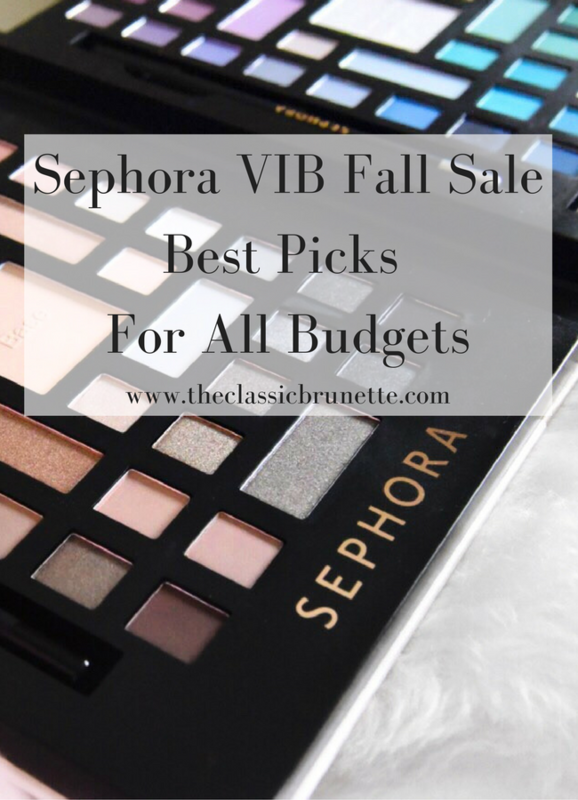 I'm just kidding, we all know that the real most wonderful time of the year AKA Christmas is still a month away, but in the meantime we have the Sephora VIB sale, Thanksgiving, and Black Friday to carry us through until the Christmas mania really begins. (Although let's be real, I'm one of those people who starts listening to holiday music on November 1st 😉 ) I was debating on posting this, as I'm sure so many other bloggers have already covered the sale, but from polls on both Twitter and Instagram Stories it looks like you all want to see my picks anyhow! 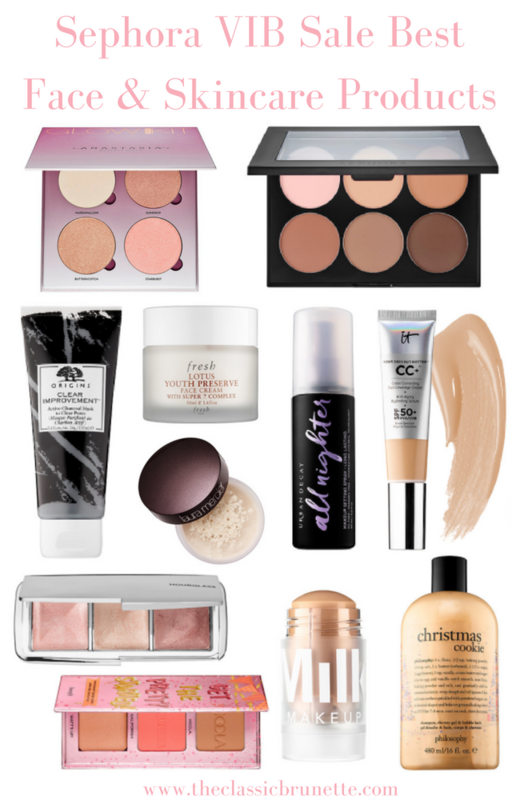 I'm sharing a bunch of different makeup categories which each have options for every budget, so this is great if you're thinking about buying some of these products as presents! So even if you haven't spent enough this past year to be VIB, you can still get 15% off your purchases! Check out all my best picks below, all with their prices BEFORE the sale (meaning it's even cheaper than I listed it!). 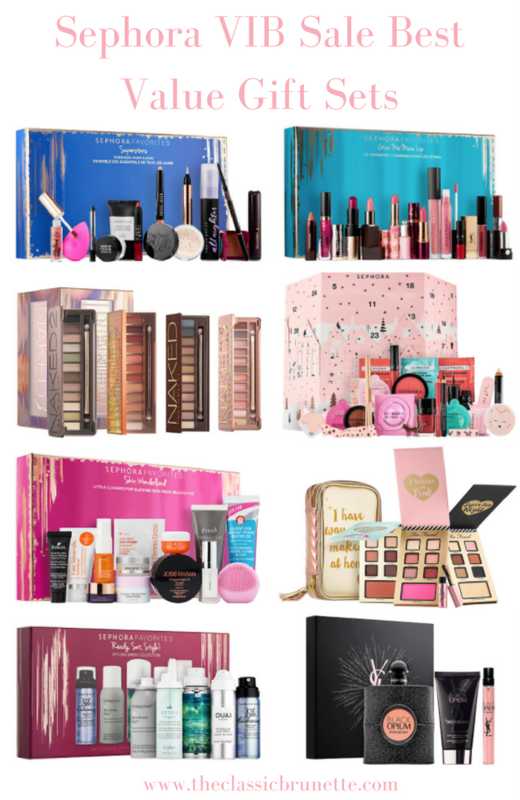 I'm a big fan of the gift sets Sephora sells every year, especially the 'Sephora Favorites' ones that give a variety of items from a number of different brands. They also notoriously have a better value than the rest of the sets. However, limiting yourself to just those sets can cut out a lot of great products, so of course I had to include other sets as well. I'll be doing this for every category, but here's some extra info on a few items from this section. Everyday Must Haves Set: This set is perfect if you're a fan of every kind of beauty product or are looking to get a great base going for your makeup collection. It has practically everything you could need from mascara to setting spray and all these products are deluxe sized versions of beauty "superstars." These products are the best of the best and are completely worth the hype that they receive! Urban Decay Naked Palette Set: I personally think this is a great deal if you include the discount percentage! I'm obsessed with my original Naked Palette, and have used everything but the new Heat palette. These are some of the best quality shadows and are great for the price. With the discount before and after the sale you can get up to a whole palette for free! Black Opium Gift Set: This is my absolute favorite scent on the planet. It's a little more on the expensive side, however I've never found a perfume that I love so much. It's sweet, but also has spiced undertones which gives it a much more interesting and pleasant smell. I asked for this set last Christmas and don't regret this gift set at all since I use it practically every day! If you can't tell, I really recommend purchasing some eyeshadow palettes during this sale! They're one of the more expensive things when it comes to beauty, so if there's one that you've had your eye on for a while, now is the time to buy! Modern Renaissance Palette: If you haven't already seen my review of this palette, go check it out HERE! This is one of my favorite palettes, and I would repurchase again and again! Stila Stay All Day Waterproof Brow Color: I know this technically isn't an "eye" product, but I don't think it fit in better here than with face products. I just recently purchased this and love love love it! I already have a set routine when doing my brows, however this cuts the time in half and creates more definite lines and a bolder look overall. I really love how my brows turn out when using it! Stila Glitter Liquid Shadows: These are probably another one of my favorite products on this post. I currently have the shade Kitten Karma and use it any time I want to amp up a look with some glitter. I actually used it during Halloween and LOVED how it turned out. I layered up enough of it to make my eyes look more dramatic, however with one application it can also be used as something for everyday! Sephora Contour Kit: If you've never tried contouring before, this is a great place to start! I actually use this one every time I take photos for the blog! In the future I might upgrade to something different, but this one works great for those who aren't contouring every day. Fresh Lotus Youth Preserve: I've talked about my love for this moisturizer before, but it really is amazing! My skin feels extremely refreshed after using it. It's what I use after every shower to re-moisturize my dry skin. HOURGLASS Ambient Metallic Strobe Lighting Palette: Although I haven't used this exact palette before, I have tried out Hourglass' other highlighting palettes and think they do an incredible job. Definitely worth the splurge. Colourpop Feelin' Fine Lip Gloss Trio: I just ordered this for myself when news broke that Colourpop was now available at Sephora! I've actually never tried the brand before, but I've heard great things, so you'll definitely be hearing about how I like this! BITE Agave Lip Collection: This lip set is such a great deal! It has a lip scrub, mask, and balm in my favorite lip healing product line! I would love to know what you think of my picks, what you'll be purchasing from the sale, and anything that's on your wishlist! I didn't realize that Beauty Insiders got 15% off too -- so awesome! I've had my eye on a couple of the palettes that you shared. I am a huge Sephora junkie and always looking for a deal! I LOVE all of these picks! 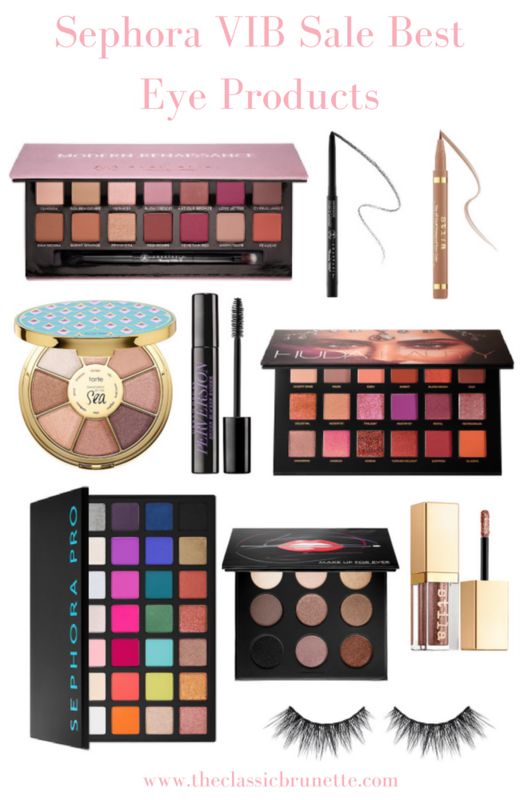 I am a makeup lover, so all of these are on my list for sure!! Thanks for sharing! i love colourpop! didn't know it was sold at sephora now! Love these picks! I stocked up on some of my faves over the weekend! Glad we get a round 2 for the sale next week too! I love the value sets so much & that Black Opium gift set is definitely coming home with me! I want it all haha. I am a sucker for a good sale. I was soooo looking forward to buying the Naked Heat but bought the Mod. Ren. instead and have no regrets! I want to try MILK products as well. Love Sephora! So many great products to choose from. And always watching for their great deals. I need to up my Sephora Game. I haven't been a VIB for 2 years! Great comprehensive list of product! I guess I'll wait until the 10th to do some damage. I really want the Naked Palette set, it's SUCH a great deal! this post is so eye catching! i definitely splurged on the sale! I don't wear too much makeup, but I have friends that would go crazy over this sale. It's definitely a good time to start Christmas shopping. I actually need a few things, so I'll def be checking out the sale! I pretty much want everything you picked haha! Loving all of your picks!! I'm so excited to shop this sale, it's the perfect time of year for it! The gift sets are the cutest! These are awesome picks!!! 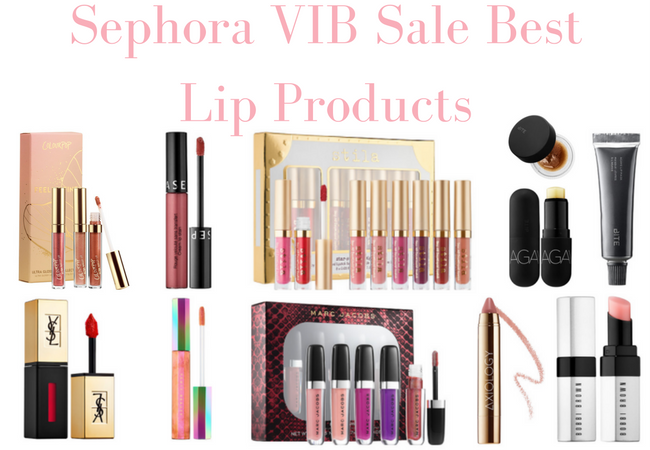 I love shopping the VIB Rouge sale this time of year. Love all of your picks! This sale is always a wallet killer ;)! Love your picks! I've actually never shopped at Sephora before... May need to pop in there noe of these days!! All excellent picks! I LOVE that Tarte Rainforest of the sea palette so much! Such a thorough round up! I love everything about this!